At the end of the 16th century chanoyu, centred on the trading city of Sakai, became very popular. The powerful merchants of Sakai collected meibutsu (famous tea utensils), and enjoyed a new style of chanoyu. At this time Oda Nobunaga drove Ashikaga Yoshiaki (the 15th Muromachi shogun, 1537-97) out of Kyoto, bringing to an end the Muromachi shogunate. 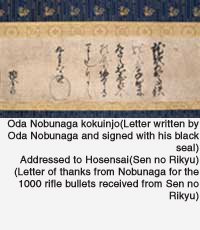 This was the period in which Nobunaga's influence reached its peak as he brought the whole country under his rule. Aware of the popularity of chanoyu, Nobunaga himself became a tea devotee. We do not know the exact date at which Rikyu became Nobunaga's tea master, but it is thought that he was in his service in the first year of Tensho (1573). Nobunaga's government, which used chanoyu for political strategy, was called 'ochanoyu goseido' (chanoyu government). He also put a lot of energy into collecting famous tea utensils, which was known as meibutsugari (utensil hunting) and used them to reward retainers who had rendered distinguished services. As a result, the value of a famous utensil became equal to that of a fief. In Tensho 5 (1577) Rikyu's wife Hoshin Myoju passed away. Soon after this, Soon became Rikyu's second wife, and her son Shoan was adopted by Rikyu. In Tensho 10, Nobunaga died during the attack on Honnoji in Kyoto and after this Toyotomi Hideyoshi gained control of the country. Rikyu, who became Hideyoshi's tea master, gradually became famous throughout Japan. At the same time he played an important political role as Hideyoshi's close associate. In a letter written by Otomo Sorin at this time it says, 'For confidential matters Soeki (Rikyu), for official matters saisho (Toyotomi Hidenaga)'. Hideyoshi's secretary for private matters was Rikyu and for public matters his younger brother Hidenaga. Toyotomi Hidenaga (1540-91) was Lord of Yamoto Koriyama. He learned chanoyu from Sen no Rikyu and had a close friendship with him. Saisho was his official title as advisor to Hideyoshi. So Rikyu's influence within Hideyoshi's government was immense. At this time Rikyu moved from Sakai to Kyoto and built a residence opposite the gate of Daitoku-ji temple with a tea house called Fushin'an. This became the base for Rikyu's activity in chanoyu.